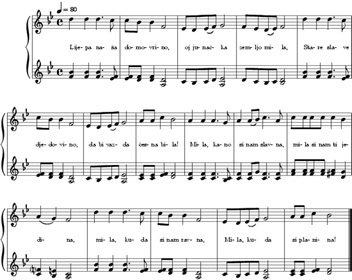 The Croatian national anthem was written by Antun Mihanovic, in 1835 it was first printed in the "Danica" newspaper under the name "Horvatska domovina". Subsequently in 1891 it was first sung as the Croatian national anthem under the name of "Lijepa nasa" by the Croatian-Slavonian Economic Association in Zagreb. Antun Mihanovic; was born 10 June 1796 in Zagreb and died 14 November 1861.